Partner with GTM and see how our continued growth and stability is evidenced in part by the long-standing relationships we have developed with our network of Business Partners. Working closely with numerous referral partners nationwide across a diverse range of industries, GTM continually strives to enhance our collective services and ability to serve our clients and community. Payroll may be a small part of the services that you provide to your clients; however, it can be time consuming without the right tools. GTM will develop a referral program that lets you stay in control of your clients’ payroll while having us do the work. We give you access to all of your clients’ data remotely in an easy to use interface and brand the checks and reports with your company name. Run over 60 payroll-related reports on demand and switch between clients at the click of a mouse. You have complete access to your clients’ data, even across multiple years. 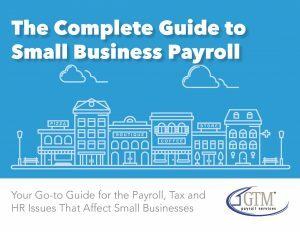 Partnering with GTM for payroll services takes the burden out of payroll and lets you focus on your core client services. Competition in the insurance world has certainly increased over the last several years, which means there are more options for businesses to consider, and therefore it becomes more challenging to retain your clients. But a mutual referral relationship with a local payroll provider can give you a leg up. That’s where GTM comes in. With a GTM partnership, we won’t compete against you for insurance business like other payroll providers might. We’ll help you retain your client base by providing data integration for benefits administration, affordable care act reporting and workers’ comp PAYGO. Your clients will find value in not only our payroll and tax service, but in our across-the-board solutions for all business needs, including time and attendance systems and Human Capital Management solutions. You can manage our mutual clients’ insurance needs and refer clients needing a payroll provider to GTM. Plus we’ll refer clients without insurance to you and share data and carrier feeds, allowing both our businesses to grow. Your clients may need specialized, expert assistance with payroll, HR management, or workers’ compensation and disability insurance. We can develop custom branded resources and tools that keep your company and products in front of your customer, all while letting us do the work. Partnering with GTM lets you focus your core skills and services. GTM Payroll Services provides payroll processing and referral services to banks and credit unions located throughout the Capital Region. GTM offers financial institutions an opportunity that goes beyond the usual referral relationship. Our payroll program is designed to compliment your bank’s product line and to open new opportunities by providing a complete business solution to your customers. We provide custom branded software and tools that keeps your company and products in front of your customer. This program helps you to compete with large national bank offering payroll services as a business service. Partnering with GTM allows you the flexibility to offer more commercial opportunities to your account base. Your clients may need specialized, expert assistance with payroll, HR management, or workers’ compensation and disability insurance, which could accumulate to a gross misuse of your time and resources. GTM has developed a program to assist you in managing your clients’ legal needs, while having us do all the work. Partnering with GTM lets you focus on your core skills and services.